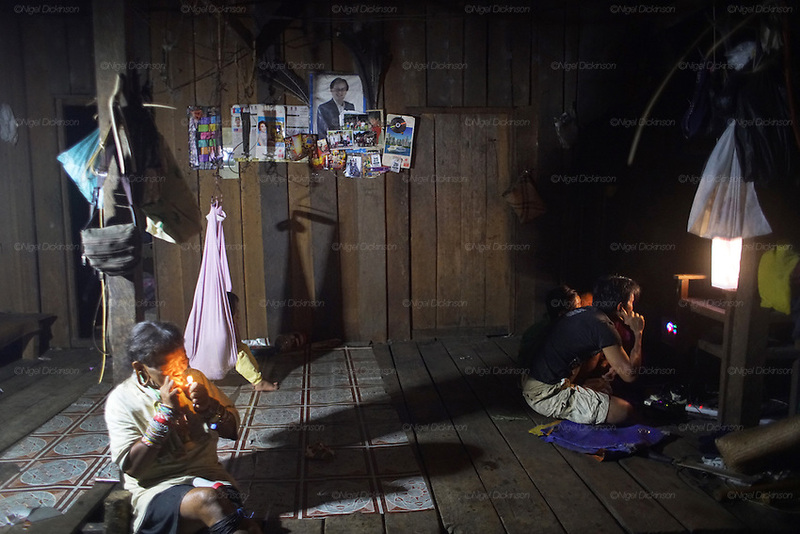 Using petrol generators, the Penan can afford to have electricity at night. The children like to watch bollywood movies even though they don't understand the words. The Penan native people are learning to live a sedentary lifestyle which includes living in wooden houses, farming and fishing. They were traditionally nomadic hunter-gatherers. These days they have become forcibly settled as their hunting grounds have been largely destroyed by logging concessions and palm-oil plantations. There are only a few, difficult to find, scarce communities of semi-nomadic Penan nowadays, who live like of those of old, hidden away deep in the tropical forest, hunter-gathering, wearing loin cloth ‘chawats’, hunting wild boar with blowpipes and poison arrows, and extracting sago-root flour, their staple carbohydrate, by hand.